Kiwi - Are You Ready for a Change? People are attracted to kiwifruit because of its brilliant green color and exotic taste. But, the real uniqueness of kiwi fruit comes from its health benefits. 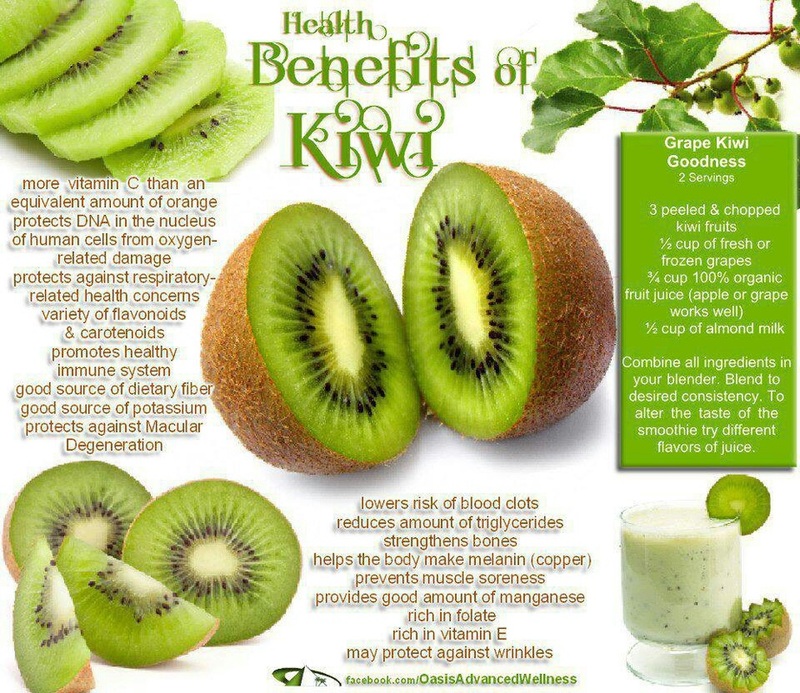 Read the kiwi’s fourteen health benefits, interesting facts, and how to use this amazing powerfood. Eating 2-3 kiwis a day has been shown to reduce the potential of blood clotting by 18% and reduce triglycerides by 15%. Many individuals take aspirin to reduce blood clotting, but this causes many side effects including inflammation and intestinal bleeding. Kiwi fruit has the same anti-clotting benefits with no side effects, just additional health benefits! Macular degeneration is the leading cause of vision loss in older adults. A study on over 110,000 men and women showed that eating 3 or more serving of fruit per day decreased macular degeneration by 36%. This is thought to be associated with the kiwi’s high levels of lutein and zeaxanthin — both of which are natural chemicals found in the human eye. Although both fruits and vegetables were studied, this same effect was not shown for vegetables. Kiwi is in the ‘most alkaline’ category for fruits, meaning it has a rich supply of minerals to replace the excess of acidic foods most individuals consume. A few of the benefits of a properly acid/alkaline balanced body are: youthful skin, deeper sleep, abundant physical energy, fewer colds, less arthritis, and reduced osteoporosis. For nutritional balance it is always good to eat a variety of foods. Each food has its own unique qualities and powers. The trouble with most people’s diet is that we eat such a limited number of foods. It increases our chances of not getting enough of important nutrients. Kiwi fruit is on the list of foods that are generally safe from a lot of pesticide residues. For 2012 it came in with the top 10 safest foods. While it is always good to support organic when you can as a matter of principle, it’s also good to know whether there is a big danger if organic is not available or viable for you. Kiwi fruit was named after the New Zealand Kiwi bird – an unusual flightless bird- because they are both small, brown and furry. Although Kiwis have been native to China for centuries, practically no one in the North knew what they were 50 years ago. They were first introduced to the U.S. in 1962. They caught on fast! Although kiwifruit can grow in any temperate climate, most of the world’s kiwi are grown in Italy, New Zealand, and Chile. It is grown much like grapes. If a kiwi does not yield a bit to finger pressure, it can be ripened by storing it at room temperature away from the sun. This ripening can be hastened by putting it in a paper bag with a banana, apple, or pear. Once a kiwi fruit is ripe, keep away from other fruit (even in the refrigerator) since the kiwi is very sensitive to the ethylene gas given off by those other fruits and it will over ripen.